Finally, acknowledgement is due to the originators of the method of satellite temperature measurements, Drs. Roy Spencer and John Christie. It is thanks to them that we have a satellite-based atmospheric temperature record to act as a reality check for the oft-adjusted surface temperature record. Very well done, gentlemen. This article is to provide Willis with not one but two reality checks. Willis penned his article to feed Anthony Watts' readers some much needed doubt. The reason they need that doubt muchly at the moment is because this year is shaping up to be another hot one. Whether it'll turn out to be the hottest on record so far or not remains to be seen. Here is the NOAA graphic in question, showing their idea of the current year to date in black, and the five warmest years in color. Man, they are squeezing it to claim this September was the warmest, looks like a three-way tie to me … but I digress. 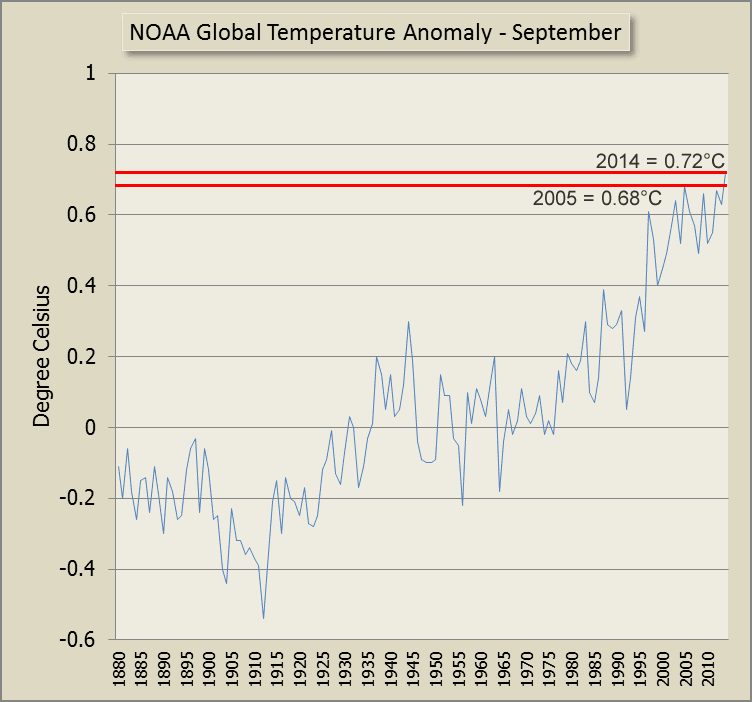 Willis' comment relating to September shows that he didn't read the NOAA chart properly. The point for September isn't just the month of September, the lines represent the year to date figure. 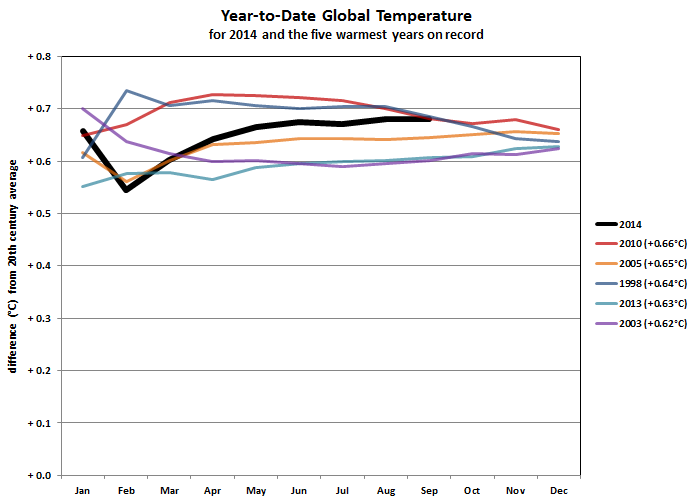 2014 is now neck and neck with the two hottest years on record: 2005 and 2010. As NOAA explains: "Each month along each trace represents the year-to-date average temperature. In other words, the January value is the January average temperature, the February value is the average of both January and February, and so on." Now, I have read in a lot of places that we currently have good agreement between the satellite temperature data and the ground temperature data. Each time I read that, I just laugh. While the two measurements are closer than they have been in the past, there are still great differences. Willis seems to think that up in the lower troposphere, leaving out the poles, the average global temperature should every month be the same as it is on the surface. What he neglects to show is how close the surface temperature records are to UAH on an annual basis. Willis praised the scientists at UAH for providing a reality check. Here's another reality check. 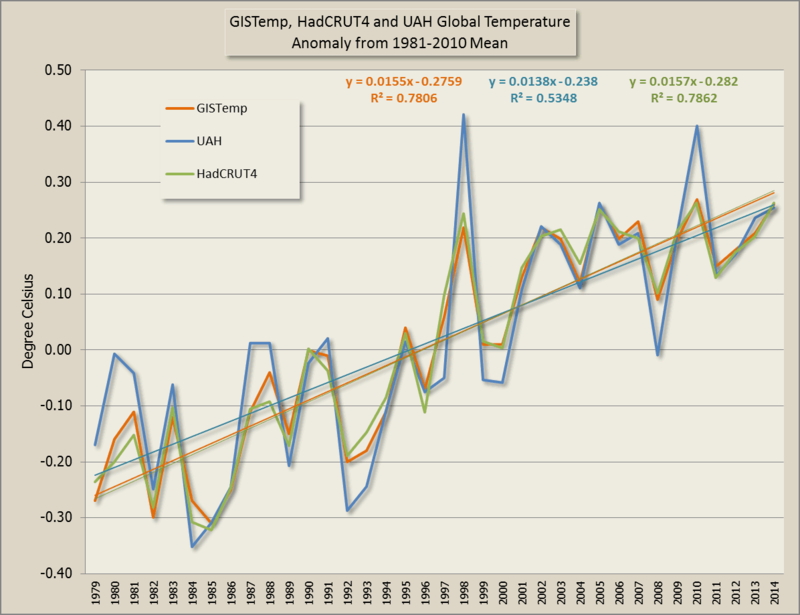 The chart below shows UAH, GISTemp and HadCRUT4 from 1979 to the present. I've aligned them all to the UAH baseline - 1981-2010. The lower troposphere record has some higher highs and some lower lows. However they are all very close to each other. Click the chart to enlarge it. 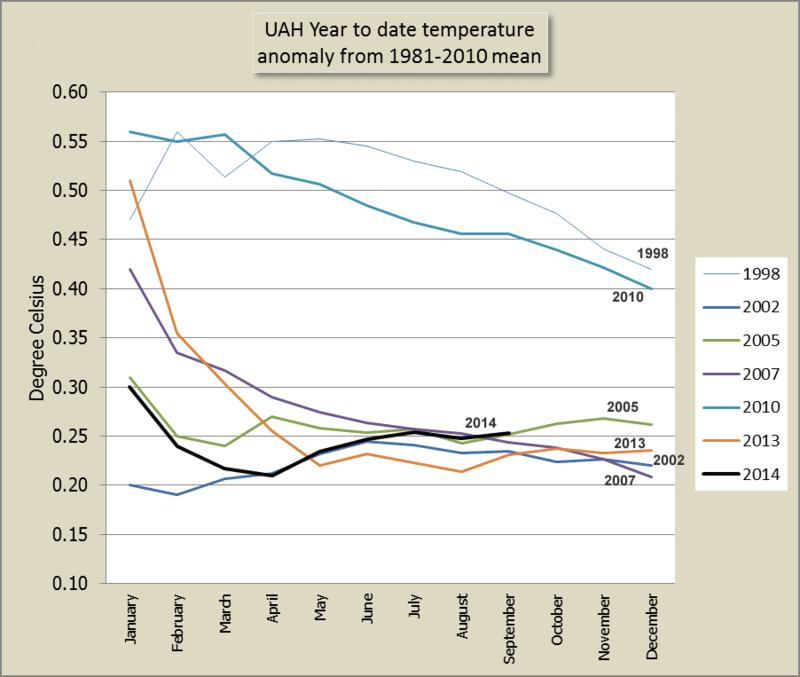 The UAH record shows a slightly lower trend, mainly because the first three years were all higher than GISTemp and HadCRUT. Still, there isn't much between them. If you look over the 32 years since 1982 the trend is even closer, as the chart below demonstrates. Before you get stuck into me for not being purist scientific, I'm not suggesting that anyone discard years of data just to give a "better" answer. UAH is higher in some years and lower in others. I just put up that chart to show that three years at the beginning are largely responsible for the difference in the trends. You can also get stuck into me, if you want to, because I added the average to date for 2014. 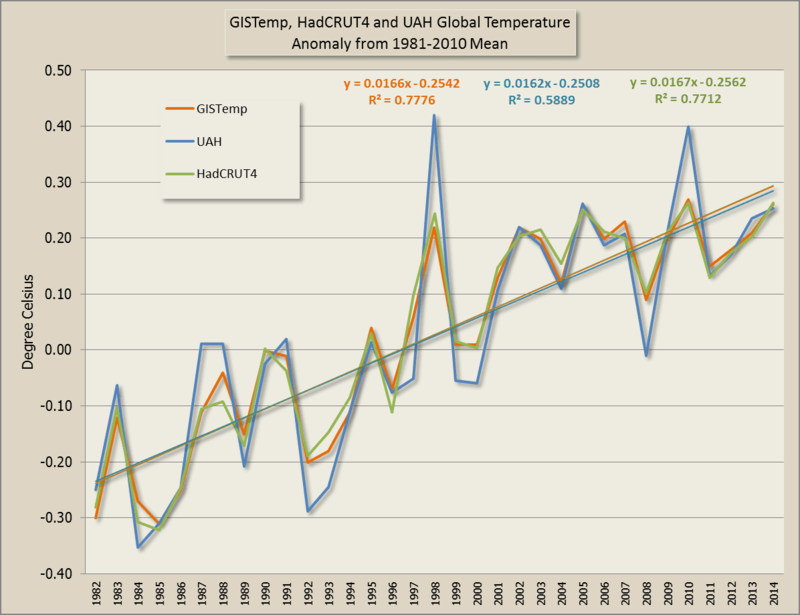 After all, UAH and GISTemp have nine months data and HadCRUT has eight. The final number for 2014 is probably not going to be too different to the average year to date. Anyway, look at the difference. From 1982 to the present you have to go to four decimal places to see a difference in the trend/year between any of them. If you take the entire period, from 1979 to the present, the difference in the trend (highest minus lowest) is less than 0.0019°C/year or 0.019°C/decade or 0.19°C/century if the trends stayed the same for another seventy years or so. Which isn't likely. What is the reason for this huge difference in the surface and tropospheric records? I think it is a result of two things—the endless upwards adjustment of the surface data, along with the always-growing urban heat island effect. Now look at the charts of annual averages and tell me, where is this "huge difference"? If there were endless adjustments of the surface data, given the trend of the three sets is almost indistinguishable, does that mean that the satellite record has also had "endless upward adjustments"? Yes, he would say that. It's not that there is much difference on an annual basis. If you look again at the charts above, the annual average for UAH for 2012, 2013 and this year to date is almost identical to that of GISTemp and HadCRUT. If you are wondering why there are differences between temperatures in the lower troposphere and temperatures on the surface, there was a publication back in 2006 that addresses the subject. It was published by the US Global Change Research Program. Chapter one can be downloaded here. You'd expect there to be differences on a day to day basis between the lower troposphere and the surface. Probably even on a month to month basis. The atmosphere has its own dynamics. The air isn't the same temperature as the surface going all the way up, or going sideways. Not only that, but the observations and how they are calculated are quite different. The lower troposphere temperatures come from Microwave Sounding Units on polar orbiting satellites. These readings then have to be adjusted to account for satellite drift and probably other things. Then calculations are made to convert the readings into a temperature scale. UAH (and RSS) satellite records don't provide temperature at a point or particular height in the troposphere, it's an average over a thick layer. Also, the satellites aren't too good over the poles, particularly over Antarctica, where the altitude and snow mess with the readings. UAH cuts out 15 degrees of latitude (7.5 top and bottom). RSS is more conservative, only going between 82.5°N and 70°S. The surface data is from thermometers on land and on the sea. Again, the poles aren't all that well represented. Antarctica is huge and largely uninhabited. The Arctic isn't that much better. What is known is that the Arctic and parts of Antarctica are heating up faster than probably anywhere on Earth. UAH and RSS probably don't pick up all that. The surface data probably doesn't pick up all that either. Anyway. I didn't intend to get into too much detail. I just wanted to give Wondering Willis Eschenbach a couple of reality checks. I forgot about this chart I did earlier. It's another reality check for Wondering Willis. The animated chart shows UAH annual average and the UAH September only average going back in time. What's interesting about this (the reality check of sorts) is that the trend for September at 0.187°C/decade at is quite a bit larger than the trend for the year as a whole (0.138°C/decade). My thanks to all of those sharp commenters who pointed out that I was showing the monthly anomalies, not the YTD averages as NOAA had shown. It is one of the joys of writing for the web that my mistakes don’t last long without being spotted, which typically saves me weeks of work chasing blind alleys. Figure 2. My UPDATED graphic showing the UAH MSU T2LT lower temperature data. Sadly, lack of sleep took its toll, and I showed the individual monthly values in my previous graphic, rather than the year-to-date average. My error has no effect on the conclusions of the post. Note that the MSU anomalies have been re-baselined to match the NOAA anomalies. Data Source. I'd say that he is still suffering lack of sleep. Below is what he should have posted. It is comparable to the chart in Reality Check 1 above. "Each month along each trace represents the year-to-date average temperature. In other words, the January value is the January average temperature, the February value is the average of both January and February, and so on". Click to enlarge, as always. In the lower troposphere, 1998 will still be the hottest year in the UAH record, followed by 2010. This year is just edging ahead of 2005 on a year to date basis. 2005 is currently the third hottest year in the UAH record. 2014 would need larger anomalies for the rest of the year (October to December) to keep pace with 2005. Note that I didn't "rebaseline" UAH. I prefer to use a baseline where I can calculate an average using the same set of data, rather than just deduct some arbitrary amount from all the numbers. UAH doesn't have data for the NOAA baseline period. In any case, we are comparing years within a particular set of data so the absolute values between temperature data sets aren't relevant. It's just the order of years that we are considering. (And the lower troposphere isn't the surface anyway.) If you want to compare the satellite and surface records, I've done so in this article higher up. There was a comment in another thread asking why NASA thinks that this year is looking to be another hot one. So I've prepared another year-to-date chart, similar to the others, using GISTemp. Click to enlarge. As you can see from the thin red line, 2014 is already pretty well level with the second hottest year in the GISTemp record. It wouldn't take much for it to reach or exceed the record of 2010. TYoke might not be aware that it was the UAH team that made a blunder at one stage, and had to go back and correct it. Too right about the value of the Satellite record. Without it, it seems very likely indeed that the surface guys would have ‘adjusted’ the record to fit alarmist predictions. norah4you - I haven't got a clue what she/he is trying to say. Anyone? Had someone among scientist bothered taking a good look at last year’s vulcano eruptions in water or close to water in region Berings Straight via Aleutian Islands over to Kodiak Islands, they would have a better understanding of why winds, streams and much more are effected by underwater vulcanos CO2-produce. Also why it’s impossible to use reradiation temperature instead of meassuring temperatures 1 resp 3 meter over actual waterlevel AND also under not only in a few places but at least each 100 square kilometer. The reradiation figure is in itself a fake reading. So many factors are involved in which reradiation can be “found” that this is more How to lie with statistics than not. Bill 2 points out that Willis misread the NOAA chart. NOAA graph is showing year to date average, not individual months. Suppose last month was indeed “the hottest September evah!” — at least, since reliable records began. When one considers the age of the planet and the length of the period for which no accurate record exists … what useful conclusions may be derived from this hottest of Septembers? In any case, has the anthropogenic signal been plausibly distinguished from the natural one? If so, can it be definitively asserted that, in the absence of the anthropogenic signal, the Earth would not be warming? Is there any point pursuing this exercise any further? Neville asks if Wondering Willis is accusing NASA of committing fraud. So we can take it from Willis’s quote above that he thinks that GISS etc are indeed publishing/promoting fraudulent temp data? David A says that 1998 is the hottest year in the UAH record. And it is. But look at the charts above again. They are anomalies from the same 30 year baseline. The trend is remarkably similar, despite some greater year to year extremes in the satellite data. Nick, the overwhelming fact is that satellites show that every month of the year was cooler than 1998, with the 1998 anomalies double the 2014 anomalies. 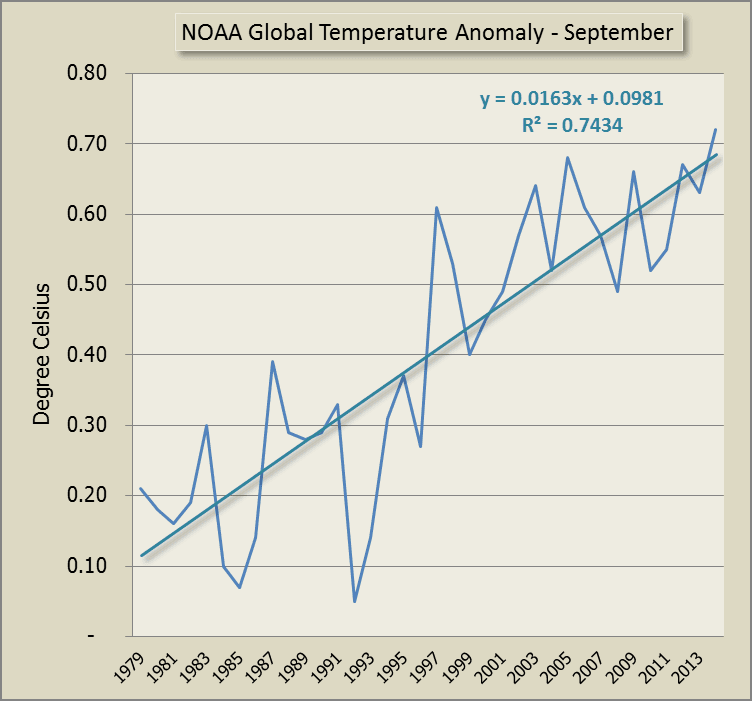 I had seen the NOAA graph on twitter before and had also misread it and wondered what the fuss was about. Thanks for correcting. The satellite datasets are highly adjusted. In the beginning they even showed cooling. Only after "endless upward adjustments" they seem to be more reasonable. They have to be adjusted for the height of the satellite, for the deterioration of the sensor, amplifier and antenna, for the drift in the orbit (can be important because of daily cycle in temperature) and so on. Those satellites being up there you cannot take them into the lab and recalibrate the electronics; you need some faith and hope you did all the adjustments right. If there were a difference between the satellite retrievals and the instrumental record, the first place to look for errors would be the satellite retrievals. There was just a very informative new blog post by Carl Mears or RSS (the other satellite dataset): "The recent slowing in the rise of global temperatures". Worth reading. He seems to agree with me and writes: "A similar, but stronger case can be made using surface temperature datasets, which I consider to be more reliable than satellite datasets (they certainly agree with each other better than the various satellite datasets do!)." If liked this paragraph a lot: "Also, a philosophical comment -- often, we are predisposed to the position that a given effect is due to a single cause. Part of the reason for this is probably human nature. We like to distill complex things into simple stories or parables. The other part is that for most of the science courses we take in school, simple experiments are presented that demonstrate the fundamental ideas in the topic under study. Single causes are often the case in laboratory experiments -- these experiments are usually designed to isolate a single causative effect. In “real-world” science, such as the study of Earth’s climate, things are very unlikely to be as clear cut. Instead, each observed “effect” will be due to the combination of numerous causes. My point is that I do not expect the disagreement between models and observations over the past 15 years to be due to a single cause. It is much more likely to be due to some combination of the possible causes listed below." Really the surface temps and the lower troposphere temps are two independent metrics. So I smile when I see some blogs averaging them together etc. To get from one to the other requires a conversion apparently. ""Satellite data measures lower atmosphere temperature, not surface temperature, so the two are not directly comparable. As a result most of our work has been devoted to testing whether what we are doing is valid. One way we do this by leaving out surface observations and seeing if we can predict what they would have been. This tells us that we can use the satellite data, at least over land." Extracting the lower troposphere temperature from the satellite signal requires (wait for it) a model of the atmospheric column. What's more, it's an imperfect model. yeah, but satellites are satellites, and the satellites are more accurate because....reasons. Satellites are more accurate because the show the smallest trend, which can be used as political argument against mitigation. Satellites are better because they're more high-tech! We all know that a simple ground-based thermometer can't compare in accuracy to the wonders of space age technology. I think it's wonderful that these instruments have been developed and placed in orbit but they are a work in progress. What's more, interpreting the data they return is difficult. If Weng et al. (2013) is correct, there may be a significant, overlooked cool bias to current LT/MT reconstructions, which wouldn't surprise me at all. Poor Willis appears to have a serious case of amnesia (well, OK that is usual in denier circles). He seems to have forgotten that it is thanks to the scientists who spotted errors in the work of Spencer/Christie that we have accurate satellite data: those two were calculating trends that were wholly incorrect until their errors were pointed out. "A similar, but stronger case can be made using surface temperature datasets, which I consider to be more reliable than satellite datasets (they certainly agree with each other better than the various satellite datasets do!). So I don’t think the problem can be explained fully by measurement errors." Roy Spencer makes comments on his website about how superior and unadjusted the satellite temp data is. Ignoring the fact that they are really the average temp of a column of air, they are still adjusted (as was pointed out in a comment above). He then goes on to make this strange comment about the 'thermometers" in the satellites themselves, ie devices around 100km or more away from the temperatures they are measuring! This has got to be considered a fallacious red-herring or a 'bait and switch'. I believe the temps are not measured directly by the satellites, but are derived from an oxygen microwave emission proxy. "Satellite microwave radiometers, however, are equipped with laboratory-calibrated platinum resistance thermometers, which have demonstrated stability to thousandths of a degree over many years, and which are used to continuously calibrate the satellite instruments once every 8 seconds. The satellite measurements still have residual calibration effects that must be adjusted for, but these are usually on the order of hundredths of a degree, rather than tenths or whole degrees in the case of ground-based thermometers." Opps I went and repeated some of Victor Venema's comments - sorry about that. I notice that UAH seems to exaggerate the El Nino years of 1998 and 2010 (warmer) and the La Nina year of 2008 (cooler). If this is a systematic effect and an official El Nino does kick in, Willis will have some explaining to avoid doing. I nearly forgot about a chart I did earlier. I've added reality checks 3 and 4 as an addendum. Here's a question that I am asking myself for some time about the oh so reliable UAH: what's going on with version 6.0? 1. There's a major problem and Spencer & Christy are clueless about how to solve it. 2. There was an error in previous versions that Spencer & Christy don't like to admit. 3. Spencer & Christy are too busy spreading misinformation, leaving not enough time to do their actual job. Maybe someone has a better explanation? September 2006? Is that right? The earliest mention of Version 6 I can see on Roy's blog is December 2011, which doesn't mean that he hadn't been thinking about it for longer, of course. "We caution that there are still likely to be some changes to v6.0 when it is released in a month or two"
"After 3 years of testing many different ways to solve uncertainties with the MSU/AMSU data we are getting close to releasing v6.0." Thanks. Seems they have been getting 'very close" for a very long time. I think v6.0 must be in the same queue as the "Surface Stations" project. Microwave Sounding Unit (MSU) and Advanced Microwave Sounding Unit-A (AMSU-A) observations from a series of National Oceanic and Atmospheric Administration satellites have been extensively utilized for estimating the atmospheric temperature trend. For a given atmospheric temperature condition, the emission and scattering of clouds and precipitation modulate MSU and AMSU-A brightness temperatures. In this study, the effects of the radiation from clouds and precipitation on AMSU-A derived atmospheric temperature trend are assessed using the information from AMSU-A window channels. It is shown that the global mean temperature in the low and middle troposphere has a larger warming rate (about 20–30 % higher) when the cloud-affected radiances are removed from AMSU-A data. It is also shown that the inclusion of cloud-affected radiances in the trend analysis can significantly offset the stratospheric cooling represented by AMSU-A channel 9 over the middle and high latitudes of Northern Hemisphere. Yes, cloud cover would be a biggie (clouds trap heat below and the direct MSU measurements are all taken above any clouds), also the TLT MSU is based on radiosonde (launched from the surface AFAIK) and the direct MSU measurements are taken from a higher elevation than the true TLT and a curve (from the radiosonde data, I believe) is used to calculate the TLT reported (as Cugel mentioned above). Also, don't ever try to get the non-anomalized time series from either UAH or RSS as the temperature time series ~10 km above the ground (the Himalayas are also masked out) as that time series is significantly colder then the surface, wouldn't make for good PR. So the so called ground truth for the satellite datasets, has always been, you know, the ground/surface temperature datasets. D'oh! There was a blog somewhere where an RSS person talks candidly about the MSU issues. They don't do high plateaus as you mention (think Tibet and Antarctica), I think they might have problems with ice. Basically they end up with gaps that are filled in just like the surface temps. Harry Twinotter, do you mean this comment by Carl Mears on my blog? This nudges in a rare moment of (limited) empathy with the deniers. When someone says "satellite data" one imagines sweet smelling super-info harvested at the cutting edge of science. This isn't the case with the UAH/RSS TLT products but you need to care about the facts to find this out. Victor Venema : thanks for linking that comment. Very informative. Maybe the word satellite sounds nice and high tech, but a satellite can just measure radiation. When it comes to physical properties of the atmosphere, it will normally be inferior to real measurements. Especially when it comes to climate, because you cannot calibrate the instrument regularly and the type of sensor and satellite changes regularly. But the great thing is the global overview, which direct measurements typically do not have. That is what you should use satellites for. Even if the UAH satellite data were wonderously adjustment-free, and even if these data were showing a plateau or (gasp!) a short-term decline in the global atmospheric column's temperature, so what? We live on the planet's surface. We are affected by what happens at the planet's surface. An atmospheric column's average temperature says nothing about what is happening at the planet's surface, especially when the physics of 'greenhouse' gases is such that increased concentrations of greenhouse gases will and do result in a proportionate shifting of heat to the surface relative to higher altitude. The Eschenbachs of the world are true intellectual pygmies (with apologies to pygmies) of the most profound sort. Bernard J., yes also that. And they call it TLT, Temperature Lower Troposphere, but TT would have been sufficient. If I understand Carl Mear's discussion correctly, RSS does not attempt to fill in the coverage gaps, they just leave them out. "Figure 2. My UPDATED graphic showing the UAH MSU T2LT lower temperature data. Sadly, lack of sleep took its toll, and I showed the individual monthly values in my previous graphic, rather than the year-to-date average. My error has no effect on the conclusions of the post. Note that the MSU anomalies have been re-baselined to match the NOAA anomalies." How sleepy does one need to be to forget proper baselining? Never mind. The money quote is "... no effect on the [my] conclusions ..."
Thanks, Brandon. Willis didn't get that right either. I don't know how he got it wrong, but he did get it wrong. BTW, our friend Neville, asking if NASA is guilty of fraud has been answered: E.M.Smith October 25, 2014 at 5:19 am "So yes, GISS has persistently cooled the past and warmed the present (as has GHCN NOAA) but their work product is not a temperature series." Well yes, that's true of GHCN QA/homogenization process. I know this because, contrary to contrarian belief, GHCN is kind enough to publish both the raw and adjusted data. I can fly a single engine plane. In fact I can do aerobatics in a Pitt's Special. I also have sat in the front for many hours of many Qantas 747s before 9/11. My brother is a Captain for Qantas. I could no more tell the flight crew how to manage their aircraft than all the deniers think they can inform climate scientists. I cannot not begin to know how much I do not know. Let alone think I knew anything near to being able to fly a 747. Yes, but they are armed with something you are not armed with: Dunning-Kruger! After all, it the WUWTian crowd was actually ever wrong, how come it's never been proved? "The sword swung in favor of invoking capacitance to explain the hiatus turns out to have two edges. If the system is capable of exhibiting sufficient capacitance to produce the recent hiatus, there is no valid argument against why it could not also have produced the entire modern warming, unless that can be disproven with empirical data or I/O test results." Well, thus far the system has only demonstrated sufficient capacitance to produce 20 years of hiatus, 30ish if we count 1945-75 or 1880-1910. Depending on the definition of "entire modern warming", we're looking at 100-250 years of net discharge on our capacitor. Ummm ... don't heat sinks cool off when they lose more energy than they gain? Of course they do. Must be time to nail down that definition of "entire modern warming" ... ah yes: "For purposes of defining the scope of our attribution effort, we will consider the term 'modern warming' to represent the rise in global temperature since 1980." I'll be taking that piss now. I thought about it, William. It was too weird, too long and too wrong. Weirder still that Judith endorses it. She sometimes does this - jumps feet first into utter nutter territory. I wonder does she bother to read what she's endorsing? I have only read the part Brandon cites, but I have sometimes made a similar argument: if there are skepticts that think that natural variability is large enough to explain most or even all of the warming the last century or so, why do they think that a slowing-down of the warming for one or two decades somehow disproves that CO2 makes a significant contribution? I mean, natural variability can cause a 0.8 degrees warming for 100+ years, but is too weak to counter a 0.2 degrees warming for about 10-20 years? What a painful read! It reminds me of the advice that I once gave Boz Scaggs after hearing one of his extended showpieces in Vegas. In the same vein, I say to Matt Skaggs, "My dear Skaggs too many words. There are only so many words that the eye can see." However, in the spirit of the "Capacitance Model of Climate", I wish to propose a better, alternative "Inductance-Capacitance Model of the Climate" or the Resonant Circuit Model. Does the new improved model have a 'natural' cycle? Tick. Is heating produced in the new model? Tick. Is it an improvement on the "Capacitance Model of the Climate"? Tick. Here's why. The Resonant Circuit Model can even produce voltage and current cycles that are eerily similar to the Stadium Wave Model and so it must be good. Invoking Occam's Razor, the Resonant Circuit Model is superior to the model proposed by Skaggs because it doesn't require a Root Cause Analysis, requires a minimum of words to understand how it works because a resonant circuit animation says a thousand words, resonates with the illiterati mindset and looks really sciencey. After a few more electronic components have been added to the model it will progress beyond the animation stage to something approaching this and bring gasps of "Wow! Just wow!" or "Some big light bulbs in this model!" from all who see it. Some detractors may say "Too many notes!" but I'll say "They laughed at Galileo! And he laughed last." Hopefully, all comments will be civil and relevant. This is also funny: "With so much effort put into modelling CO2 warming while other fault tree boxes are nearly devoid of evidence, it is not even clear that the available tools are being applied efficiently." I mean, come on, how much of climate modelling is really about CO2 specifically? I guess that one could count carbon cycle models as being specifically about CO2, but for the rest, CO2 is but one little piece of the models (although one of the most well understood ones). The thing that puzzles me about this self-propelling climate thing is where did the energy come from? It must have been hiding away somewhere for, well, a long time, so where was it? And what mechanism brought it all up at the same time? Globally. A veritable sh*tload of energy. And if Durack et al. (2014) is even in the ballpark, L12 is a significant underestimate. A positive embarrassment of energy. Where the BF is it all coming from? "I mean, natural variability can cause a 0.8 degrees warming for 100+ years, but is too weak to counter a 0.2 degrees warming for about 10-20 years?" Compartmentalization, it's great. It allows one to believe two conflicting things at once in blissful unawareness. "I mean, come on, how much of climate modelling is really about CO2 specifically?" Mr. Skaggs' essay is riddled with "I've never heard about it, so it's not being done." One wonders what "little extra reading" Dr. Curry "helped" him with. Apparently it was devoid of empirical evidence. "A positive embarrassment of energy. Where the BF is it all coming from?" It's the undersea volcanoes, stupid. The findings of Llovel et al. (2014) are only valid for "refuting" Durack. Though I do feel compelled to play denier's advocate and note that Durack has gotten more attention than Llovel. Exactly. Not only must there be these huge, undetected reservoirs of warm water somewhere in the vasty deeps (all major ocean basins), but there must also be a network of gargantuan pumps. How can we have missed them? And where are they getting the electricity from? So many questions. So little physics. Is there any way I can donate to keep you blogging? I feel I need to support this. Not sure if you're serious but if you are, many thanks for the sentiment. It's something to think about. There are costs involved, but I'm not sure that the value is here (yet). Just a couple of points, Mogumbo. I suggest that you take the following test. Note that the introduction to the test states "Only a trained professional can properly diagnose a personality disorder." Could you point this fact out to your wife re 'mental health' issues. I mean, she obviously knows you better than anybody else, other than yourself but she should not be so judgemental nor jump to conclusions; she should just deal with it. In a gentle, caring and sharing way, let her know that you know that you are aware of your condition and you need her help to work your way through what is obviously a tough time for you and those around you. After all, it's not your fault and looking on the bright side, it might just be a borderline affliction. Might I suggest that instead of taking showers you should be having a long, warm bath with a calming, essential oil like lavender. And drink chamomile tea, lots of it; just stay off the aspirin, ibuprofin, Plavix and sedatives while using the chamomile but discuss it with a professional e.g. your psychiatrist. Let us know how it goes. We're all rooting for you, buddy. Having checked the Hotwhoppery, I'd have to rank this as one of the funniest posts from a WUWT fanboy for a while. Wow, the serious lack of introspection there: I can only assume that the 'wife' is really the nurse who dispenses the medication every morning.
" On multidecadal time scales, tropospheric amplification of surface warming is a robust feature of model simulations, but it occurs in only one observational data set." 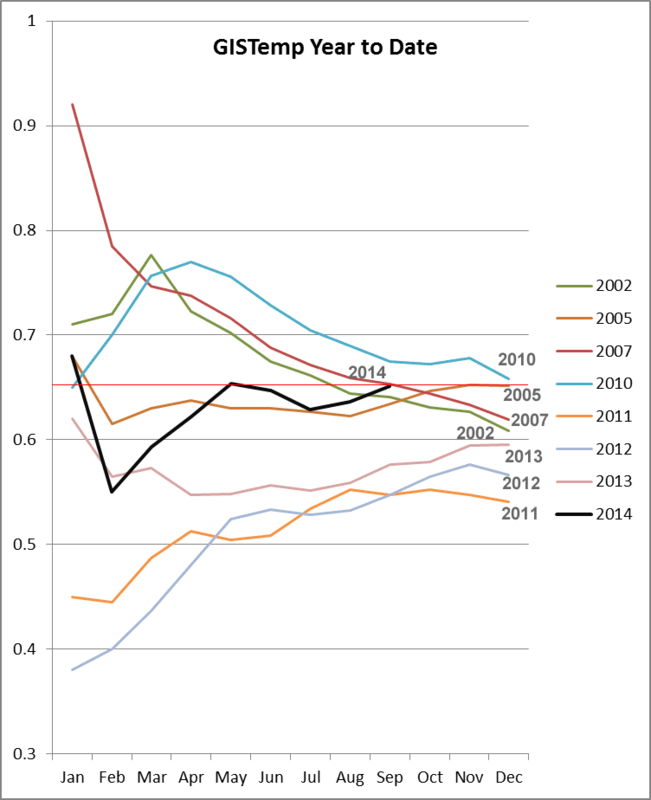 REALITY CHECK for you Sou: 9 years on from the Santer paper, now we have your graph. Where's the tropospheric amplification? The troposphere should be warming *faster* than the surface. As you have shown - it isn't. That's a good question, Rum Runner. (I'm taking it that you're referring to the tropical troposphere here.) Scientists have been thinking about this. Time will tell if its the models were wrong in this regard or if the observations are wrong. The measurements are within the margin of error, but still, one would have thought that it would have shown up more by now. There is some discussion of this in the publication I linked to in the article above. Page V has a bit about this. Also Page 2 of the report, and probably elsewhere. If you're interested in the topic, you could do worse than read that publication, even though it's a bit old now. There's probably something about that in the latest IPCC report, though I haven't checked. If you find anything more on the subject, do come back and let us know. IPCC AR5, Chapter 2, discusses this - the measurements are still quite sparse and uncertain. The satellite observations are significant modeling challenges, particularly on decadal scales (UAH trend corrections here, radiosonde data was developed for short term weather and not long term climatology, with little consistency in instruments or calibration). You might also read Santer et al 2008, the title "Consistency of modelled and observed temperature trends in the tropical troposphere" should be an indication. "Our results contradict a recent claim that all simulated temperature trends in the tropical troposphere and in tropical lapse rates are inconsistent with observations. This claim was based on use of older radiosonde and satellite datasets, and on two methodological errors: the neglect of observational trend uncertainties introduced by interannual climate variability, and application of an inappropriate statistical ‘consistency test’." I find it funny how the 2005 paper is quoted by 'skeptics' while neglecting the 2008 follow-up. The relevant IPCC discussion is in section 9.4.1.4.2, or pg 772 of thw Working Group I report. You're an idiot. Plain and simple. You have proved it now on more than one occasion, and you continue to do so. For a start, you left this part out. "or (more plausibly) that residual errors in several observational data sets used here affect their representation of long-term trends." And I suggest you actually read it instead of quote mining and misrepresenting it. the "but it occurs in only one observational data set" part, is not as you make it out to be. For a start, there are only THREE observational data sets anyway, radiosondes, RSS and UAH, and it was the RSS which was in agreement. UAH has been found to be full of errors since the publication and radiosondes are subject to a number of biases including instrument changes and solar heating. It's all laid out in the paper, that's if you bother to read it. Also, Sou's graph was NOT a comparison of tropospheric amplification anyway. Anyway, here are some quotes from the Santer paper that you need to understand. "We have demonstrated that all observed data sets and model results are remarkably consistent in terms of their relation between monthly and annual time scale temperature variations at the surface and in the free troposphere. This is a strong verification of the model physics that governs the amplification of tropical surface temperature changes." "The RSS T2LT ,T2,and TFU trends are physically consistent (all three layers warm as the surface warms), whereas the UAH data show trends of different sign in the lower and midtroposphere. These results support the contention that the tropical warming trend in RSS T data is more reliable than T 2LT 2LT trends in other observational data sets. This conclusion does not rest solely on comparisons with climate models. It is independently supported by the empirical evidence of recent increases in tropospheric water vapor and tropopause height, which are in accord with warming but not cooling of the free troposphere." Do you know what consilience means? But really, what's the point in explaining all of this to you. All of this will predictably go right over the top of your head, and you will be back with some other nonsense. Thorne et al 2011 "Tropospheric temperature trends: history of an ongoing controversy" is perhaps a useful summary of this discussion, including overviews of the various datasets. "... there is no reasonable evidence of a fundamental disagreement between tropospheric temperature trends from models and observations when uncertainties in both are treated comprehensively." Actually, the recent GRL piece that was led by Dann Mitchell, a postdoc at Oxford is perhaps most germane here. This uses the latest CMIP5 AMIP models and the RICH ensemble of radiosonde dataset estimates from Leo Haimberger and colleagues. I would be hard pressed to claim an inconsistency based upon this. Even in the tropics. The most recent ERA reamalysis paper by Adrian Simmons and colleagues in QJRMS also addresses this issue. The [your?] paper is available here. ii) filling in the "gap" in tropospheric trends by passing the buck onto the next "section" of the GCM models! Whilst I know this stuff isn't easy, it seems to me to be a very incomplete solution. Decoupling sea and atmospheric temperatures in the real world can't be done, so doing so in a model basis isn't realistic.
" It is clear that the majority of the CMIP models overestimate the tropical temperature trends over this period, although we note that the observed temperature trend at all heights lies within the 5–95 percentile range of simulated temperature trends. For example, at 300 hPa, the mean RICH temperature trend is ~0.2K/dec, but some of the models simulate trends of over double this. Some of this discrepancy arises because the models tend to overestimate the surface temperature trends. This is a common problem in global climate models and could stem from a poor representation of the Inter-Tropical Convergence Zone (ITCZ) [Richter et al., 2012], or through poor characterization of El Niño Southern Oscillation (ENSO) [in both frequency and magnitude; Guilyardi et al. , 2012]. " I believe this exchange has corrected the issues with your original comment above, on Santer et al 2005? There is at present no convincing reason to believe that observations are wholly missing the tropical upper troposphere 'hot spot' so beloved by JoNova and others - rather that there there is general model/observation agreement, with some interesting areas for research in the details. "I believe this exchange has corrected the issues with your original comment above, on Santer et al 2005?" There was nothing to correct from me. Sou answered: "Time will tell if its the models were wrong in this regard or if the observations are wrong. The measurements are within the margin of error, but still, one would have thought that it would have shown up more by now. " What "issues" do you want to "correct" for me? We can see that Mitchell '13 says "It is clear that the majority of the CMIP models overestimate the tropical temperature trends over this period". So your statement that "There is at present no convincing reason to believe that observations are wholly missing the tropical upper troposphere 'hot spot'" is wrong from the outset. Read the paper. Then read my comment. Then you can see if there's an "issue" you can "correct" for me. but with some (reduced compared to previous studies) discrepancy in the upper tropical troposphere. This holds true even for the 1979–2008 period where the issue appears to be particularly pronounced [Thorne et al., 2011a]. "These results suggest either that different physical mechanisms control amplification processes on monthly and decadal time scales, and models fail to capture such behavior; or (more plausibly) that residual errors in several observational data sets used here affect their representation of long-term trends." If equatorial convection was the big get-out card that some contrarians have argued, it would, by definition, be a strong negative feedback. Existence of such would render the climate system relatively insensitive to radiative perturbation. But paleoclimate behaviour verges on the inexplicable if the climate system is relatively insensitive to radiative perturbation. The climate system is not dominated by negative feedbacks and never has been. We can do the trop-top-trop gavotte for ever and a day but it won't get rid of the facts. In short, the major differences touted as evidence against climate science just don't exist - and the remaining differences appear to be addressable. The troposphere, contrary to your initial claim, _is_ warming faster than the surface. >>"Issues such as your quoting from Santer et al 2005 without full context,"
>>"it is shown that within observational uncertainty, the 5–95 percentile range of temperature trends from both coupled-ocean and atmosphere-only models are consistent with the analyzed observations at all but the upper most tropospheric level (150 hPa)"
without even acknowleding that this was as a consequence of their novel treatment of substituting modeled SST for their cooler observations! The difference between *complete* GCM models and tropospheric temperatures IS REAL - and is very well highlighted in Mitchel '13. It's figure ONE of the paper! The issue was real when Santer said it. It's still real 8 years later when Mitchel says it. It is in the data (both satelite datasets, AND radiosonde). It is in the model output (dozens of different models). Get over it. Mitchel '13 hasn't "solved" the issue, they've just said "look, if we remove the model output for the oceans and slip in the heck of a lot cooler observed temps then the match ain't that bad". Doing that is fine, but it opens up the can of worms as to WHY the GCMs don't model oceans well. It passes the buck. Do you really want to go there? >>"The troposphere, contrary to your initial claim, _is_ warming faster than the surface." Show me the data. And show Sou too, because she says "Computer says: No." >>"This isn't going to get you a low climate sensitivity, Rum:"
I don't know if you've ever played the great sport of Rugby? One of the terms to describe a badly thought out pass is "hospital pass". In it the man with the ball passes to his team-mate just as his team-mate has a 20 stone prop forward about to hit him at 20 miles an hour. His team-mate would have been "safe" a millisecond previously because in Rugby you are only allowed to tackle the man with the ball. Pass. Crunch. Ouch. Hospital. This is similar to what's happened in Mitchel '13. They've "fixed" the difference between modelled output and tropospheric temperatures, by throwing a hospital pass to the SST models. RR writes "The troposphere should be warming *faster* than the surface"
"While satellite MSU/AMSU observations generally support GCM results with tropical deep-layer tropospheric warming faster than surface, it is evident that the AR4 GCMs exaggerate the increase in static stability between tropical middle and upper troposphere during the last three decades"
And yes generally the models overestimate the warming trends, but so what. That's where you are getting muddled. Do you remember when we discussed climate sensitivity? That for every 1 W/m2 of forcing there will be about 0.8C of warming at equilibrium. Well guess what. That hasn't changed. WHY? Because it's not model dependent, but based on ACTUAL proxy data stretching back over the last 200 million years. Now, even if there was no tropospheric amplification, or that models overestimate the amplification that is occurring, it doesn't matter. We know from the earth's past climate history that a RF perturbation will cause warming. Period. Your exasperated diversionary tactics, no matter how obtrusive, will never change that. You're obsessiveness with tropospheric amplification or lack of, is just extraordinary and ultimately futile. Look, model discrepancies for one particular section of climate science does not, as you would probably like to believe, suddenly make the climate sensitively lower. It just means more research is required. In any mature science, from microbiology to geology, especially on the leading edge, there will be always new knowledge and new research. This is how science works. It doesn't bother me that we don't have a cure for the common cold, but it doesn't change the basics of germ theory. It's the same with climate science. Yes, there is still a lot of knowledge to be gathered, but does this change the fact that greenhouse gases if continued to be emitted at the current rate will cause serious consequences. No. Does the fact that there are model discrepancies change the earth's reaction to radiative forcing. No. I doubt that any of this will make the slightest sense to you. As we have already seen, even the most simplest concepts elude you. Climate science is just not your thing. Just accept it, and move on. Sure, you get a perverted satisfaction from trolling websites that are an aberration to your ideology, but maybe it's time for a change. It is apparent that your cognitive ability to learn and interpret is severely lacking, which is why you are so addicted to the cheap thrills of trolling. You should instead direct your pathological anger to things that are better suited to your mental abilities. Try making models with play-doh, or finger painting. I guarantee that you will be much happier doing that then obsessively trolling climate science websites. I'm not playing stupid games where you fixate on an irrelevance rather than address the core point. Do that again and I will ask that you are moderated for intellectual dishonesty. Read the words and engage in discourse like an adult or sod off. After your last shameful performance here, you have no credit left with me. [TH:] A lot of these metrics that we develop come from computer models. How should people treat the kind of info that comes from computer climate models? [Hansen:] I think you would have to treat it with a great deal of skepticism. Because if computer models were in fact the principal basis for our concern, then you have to admit that there are still substantial uncertainties as to whether we have all the physics in there, and how accurate we have it. But, in fact, that's not the principal basis for our concern. It's the Earth's history-how the Earth responded in the past to changes in boundary conditions, such as atmospheric composition. Climate models are helpful in interpreting that data, but they're not the primary source of our understanding. [TH:] Do you think that gets misinterpreted in the media? [Hansen:] Oh, yeah, that's intentional. The contrarians, the deniers who prefer to continue business as usual, easily recognize that the computer models are our weak point. So they jump all over them and they try to make the people, the public, believe that that's the source of our knowledge. But, in fact, it's supplementary. It's not the basic source of knowledge. We know, for example, from looking at the Earth's history, that the last time the planet was two degrees Celsius warmer, sea level was 25 meters higher. And we have a lot of different examples in the Earth's history of how climate has changed as the atmospheric composition has changed. So it's misleading to claim that the climate models are the primary basis of understanding. Both you and KR have made this bizarre claim (of the troposphere Ts rising faster than the surface). But where's the data? Sou's chart says: No. The papers we've been looking at here say: No. All the data that I've seen says: No. So, sorry, you can't just claim "Yes", and expect that people aren't going to ask you to prove it. So kindly put up - or concede the point. After your last shameful performance here, you have no credit left with me. " Troposphere temps _are_ rising faster than surface temps - see Santer et al 2008, stating " There is no longer a serious and fundamental discrepancy between modelled and observed trends in tropical lapse rates". and Mitchell et al 2013 (which you _claim_ to have read) - higher than surface trends for 500hPa, for 300hPa, with that changing only around 150hPa (near tropopause). This is evident in all Mitchell figures, 1, 2, and particularly Fig. 3, "Scaling Ratio" - I find it incredible that you are claiming otherwise. You've ignored relevant papers that have been part of the discussion to repeat your (incorrect) assertions. You are clearly not discussing this topic in good faith. "or through poor characterization of El Niño Southern Oscillation (ENSO) [in both frequency and magnitude; Guilyardi et al. , 2012]." A recent study found that when the model runs closely matched ENSO they closely matched the temperature record. So that seems consistent with this paper. Nope, that's the sound of the troll who was too stupid to get the equations right and too dishonest to admit his errors braying instead of responding to my points about equatorial convection and denier rhetoric about models. Get this idiot off this blog Sou. Please. >>"Get this idiot off this blog Sou. Please. " 2) I get unmoderated right of reply - 1 for 1 with every criticism you make. Look here. You were flat-out wrong on a substantive point. That is up to Sou. I should not have asked her to chuck you out either. It's not up to me. But since you will now leave of your own free will it doesn't matter. What point? Where? You didn't link to one of my points! I know it must be hard, but I believe in you BBD. You CAN do better. I'm off to bed so you've got plenty of time. See what you can knock up and I'll see you in the morning. You surprise me. Normal practice is to use the browser text search function. Type in 'Rum Runner' and step through the results. Anyway, that aside, since you insist and for only the third time, the specifics. dT = temperature *at equilibrium* but you used observational TRANSIENT response instead (0.8C). As soon as you did that, everything went wrong. CO2 has risen from 280 to 400 ppm. Temperature has risen 0.8C. Solve for lambda. I'll make a deal with you BBD. If you can prove something substantive that I've said that was wrong - I'll never darken Sou's doorstep again. You made a substantive error. That's okay because we all stuff up from time to time, but the problem here is that you refuse to admit your mistake. But there it is, plain as day. It isn't possible to deny this and retain a single shred of intellectual integrity. So I must assume this will be your last comment here. I do wonder if Weng et al. will be the next big shake-up for the satellite temperature reconstructions.